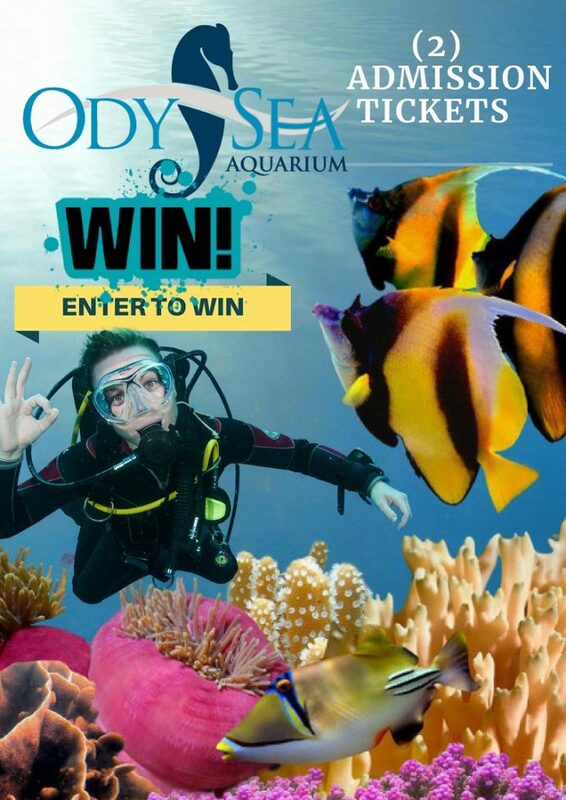 Home > Contests & Giveaways > Freebie Friday: Win Tickets to OdySea Aquarium! Freebie Friday: Win Tickets to OdySea Aquarium! It’s that time again! Don’t throw away those summer fun floaties and new swimsuits just yet – its time to get back in the water with this contest just waiting for YOU to win! OdySea Aquarium® offers an entertaining, interactive, and educational experience for guests of all ages by combining theme park-style amusement with highly engaging presentations of aquatic life. If you have been wanting to visit, now is your chance! One lucky “guppy” will win (2) tickets to ODYSEA Aquarium in Scottsdale! That’s right – we have TWO admission passes good for all-day entry. WHAT IS YOUR FAVORITE PART OF ODYSEA AQUARIUM? We will allow 72 hours for entries so no excuse for letting this chance pass you by. We will select a winner with random.org on Monday. Winner will receive notification via e-mail sometime on the following day. Comments are moderated and may take some time to appear. Please do not resubmit your comments — one will be plenty. Good luck, everyone!! In the meantime, check out all of the awesome upcoming events and happenings at your favorite Bookmans location. My favorite part is the living carousel!! That was such a neat way to show different exhibit, hear experts talk about the animals, all while sitting down!! I’ve never been to Odysea Aquarium before. However, I’d really like to go! I’m guessing my favorite part would be Penguin Point! I have never been there so I do not have a favorite part. My favorite part of Odysea was the shark tanks and interacting with the scuba divers! We have never been to the Odyssey Aquarium. But we have been to the Sealife Aquarium in Tempe. My 10 yr old is interested in becoming a Marine Biologist, so he loves studying sea creatures. I hope we are the winners so I can take him there. I’ve been wanting to go to Odysea Aquarium since it opened, but we just haven’t been able to. There are six of us so it gets a little out of our budget. I hope to win so that we can go and experience how wonderful it is! Even though my wife LOVES the turtles, my favorite part of OdySea is the shark tank! We have only been once, and we took out of town guests. The Voyager rotating exhibit was a hit with everyone. Would love to go back and spend more time exploring. My favorite part about Odyssea is the variety, they really have so many species you can see in person and learn about. My favorite part is the aquarium tunnel. My favorite part is seeing all the different marine life at one place. My favorite part is the penguin exhibit! My son would spend all day there if we let him. I don’t have a favorite exhibit yet because I have never been but I would love to take my family. As silly as it is, my favorite thing about the aquarium is the sloth! I nearly cried tears of joy when I saw her! The shark tank was honestly my favorite part. There were so many just chilling out and it was very calming. Though I did enjoy the caiman. Certainly the Otters! Enjoyed meeting the adorable Peanut, Pepper, and Gizmo, who are the just-over 2-year-old otters at OdySea’s Otter Banks. It would be so much fun to visit them again! Penguins on Parade! I only saw it during last year’s Penguin Awareness Week, which is coming up soon. My favorite part is the Rivers of the world with all the fresh water fish and reptiles. I have never been to OdySea, so I would have to say that everything would be my favorite part of it if I went. Thanks! I don’t have a favorite part because I have never been. I have always wanted to take my kids but never had the chance. thanks for the contest. I have to admit, my favorite aspect of the OdySea Aquarium is the descending escalator that give the impression of submerging in a transparent submarine! The sensation is uncanny – and beautiful! I have not been to OdySea, however, I’ve read about the fully enclosed Deep Ocean Escalator where you can view rescued sea turtles, reef sharks and giant rays! This would be my favorite part! My daughter loves the “sharks in the bathroom.” I’m partial to the ray touch tank. We learn something new each time we go! Definitely the penguins. They are so cute. One of my favorite parts of Odysea is the education they put out about all of the damage being down to Oceans and the effects it is having on Ocean life. I haven’t been, but I would love to go sometime! Thanks for hosting this giveaway! I’d love to finally attend so that I can pick my favorite part! I don’t have a favorite thing because I’ve never been there before. I’ve never been there before so unfortunately I don’t have a favorite.